Vietnam has a population of approximately 94 million people, of whom about two-thirds live in rural areas. 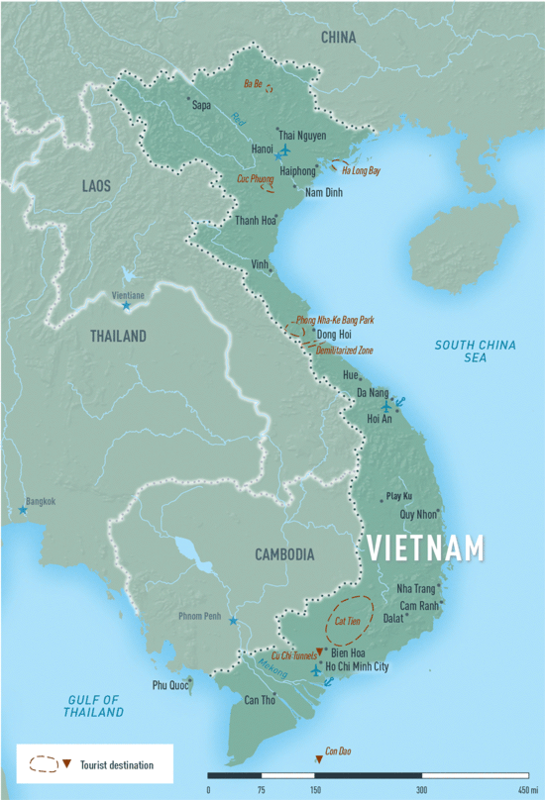 The total size of Vietnam is 127,243 mi2 (331,114 km2), slightly larger than New Mexico. It is located in Southeast Asia and borders China, Laos, and Cambodia. Vietnam is divided into 63 provinces. The terrain and climate vary, particularly between the north and the south and the mountainous and coastal areas. Once among the poorest countries in the world, Vietnam has since achieved lower-middle income status. Vietnam is an increasingly popular travel destination for business and tourism. Travelers often try to get a flavor for the entire country with a trip of at least 10 days or combine their Vietnam travels with other nearby Southeast Asia destinations such as Angkor Wat in Cambodia or Luang Prabang in Laos. There is no shortage of attractions in Vietnam, regardless of whether a traveler is interested in touring historical sites, shopping in ethnic markets or traditional trade villages, trekking or biking in hills or valleys, seeing native wildlife, cruising on the Mekong River or Ha Long Bay, scuba diving in the sea, relaxing at a spa resort, visiting art galleries, or taking cooking lessons to understand the regional variations of Vietnam’s cuisine. A typical itinerary might start in the north and include visiting the capital, Hanoi; touring the UNESCO World Heritage site, Ha Long Bay, aboard a junk boat; and exploring the rice fields in Sapa or Mai Chau. In the coastal region, travelers often go to Hue, Hoi An, Da Nang, and Nha Trang, each with its own charms and unique personality. In the south, travelers often choose to see Vietnam’s largest, busiest, and most modern city, Ho Chi Minh City. From there, Phu Quoc Island, Dalat, the Cu Chi tunnels, and floating markets of the Mekong Delta are easy trips (see Map 4-16). Travelers to Vietnam should be up-to-date on routine vaccines, including seasonal influenza. Travelers should also protect themselves by getting vaccinated against typhoid and hepatitis A. Hepatitis B protection is advised, especially for long-term travelers and expatriates, given the high prevalence of chronic HBV infection in the population. Because Japanese encephalitis (JE) is endemic throughout Vietnam, JE vaccination is recommended for all travelers who spend ≥1 month in the country and should be considered for short-term travelers who plan on spending time outside urban areas and may be involved in activities that expose them to the mosquitoes that transmit JE virus. Such activities may include camping, hiking, biking or other outdoor activities, or staying in accommodations without air conditioning, screens, or bed nets (see Chapter 3, Japanese Encephalitis). JE has seasonal peaks from May through October, and the highest rates of JE disease occur in the northern provinces around Hanoi and the northwestern and northeastern provinces bordering China. Personalized advice during a thorough pretravel consultation is important. Malaria in Vietnam is caused by Plasmodium falciparum and P. vivax. Cases and deaths have decreased substantially in the past 15 years, and ongoing local transmission is primarily a concern in rural, forested areas that are not included in most tourist itineraries. There are rare cases in the Mekong Delta and Red River Delta. There are no cases in cities of Da Nang, Haiphong, Hanoi, Ho Chi Minh City (Saigon), Nha Tran, and Qui Nhon. Travelers to the Mekong Delta should take precautions to avoid mosquito bites, such as wearing loose-fitting clothing (long pants and long-sleeved shirts) and using insect repellent (see Chapter 2, Protection against Mosquitoes, Ticks, & Other Arthropods) but do not need to take antimalarial drugs. Travelers the southern part of the country in the provinces of Dac Lac, Gia Lai, Khanh Hoa, Kon Tum, Lam Dong, Ninh Thuan, Song Be, and Tay Ninh should take atovaquone-proguanil or doxycycline. Travelers to other areas with malaria should take atovaquone-proguanil, doxycycline, or mefloquine (see Chapter 3, Malaria). Dengue is endemic in Vietnam and, although peak transmission occurs during the summer rainy season, dengue virus transmission occurs year-round. Zika is also endemic in Vietnam, but the risk to travelers is believed to be low. Because of the risk of birth defects in babies born to women infected with Zika while pregnant, women who are pregnant should not travel to Vietnam. If they decide to travel to Vietnam, they should strictly follow steps to prevent mosquito bites. Travelers should consult the CDC Travelers’ Health website (www.cdc.gov/travel) for the most current recommendations for Zika. Vietnam has reported sporadic cases of human infection with avian influenza A (H5N1) virus. H5N1 is endemic in domestic poultry in Vietnam, with continued sporadic and geographically dispersed poultry outbreaks. A novel avian influenza A (H7N9) virus was identified in China in 2013, including in a province bordering Vietnam. To date, no animals or humans have been identified in Vietnam with this strain of avian influenza virus. To avoid infection with avian influenza viruses, travelers to an area affected by avian influenza should avoid direct contact with birds, including poultry (such as chickens and ducks) and wild birds; avoid touching surfaces that have bird droppings (feces) or other bird fluids on them; and avoid places where live birds are raised, kept, or sold, such as live bird markets. Travelers should eat only bird meat or products that have been thoroughly cooked. Any dishes that contain uncooked (raw) or undercooked bird meat or products such as eggs and poultry blood should be avoided. For example, egg yolks should not be runny or liquid. Travelers should also practice healthy habits to help stop the spread of germs by washing hands often with soap and clean water or using an alcohol-based hand sanitizer (containing at least 60% alcohol) when soap and clean water are not available and hands are not visibly dirty. Drinking tap water should be avoided, as should beverages with ice. Travelers should avoid eating raw or undercooked meat or seafood, uncooked vegetables, and raw fruits that cannot be peeled by the traveler. Travelers should be cautious about eating food or drinking beverages from street vendors. Travelers with seafood allergies should be particularly cautious in Vietnam, given the common use of fish and other seafood sauces in many dishes. Travelers should be particularly careful not to consume dishes containing uncooked blood of pigs or other animals because of the risk of trichinellosis and Streptococcus suis infections (meningitis or septicemia). One popular traditional Vietnamese dish, tiet canh, is made of coagulated, fresh, raw blood mixed with cooked pieces of meat. It can be difficult to know just by looking if a dish contains uncooked blood. Ask, and when in doubt do not eat it. Skin rashes may result from fungal infections or the combination of heat and humidity. Sunstroke, sunburn, and dehydration can be problems for travelers. Efforts should be made to keep clothes, shoes, and linens clean and dry. Use of a broad-spectrum sunscreen with SPF ≥15 that protects against both UVA and UVB is recommended; travelers should keep well hydrated and minimize sun exposure by using clothing, hats, and umbrellas. Travelers with allergies or asthma may find their conditions are exacerbated because of high levels of particulate matter and indoor air pollution, especially in Hanoi and Ho Chi Minh City. The US Department of State in partnership with the US Environmental Protection Agency monitors air quality in Vietnam (https://airnow.gov/index.cfm?action=airnow.global_summary#Vietnam). Short-term exposure to these levels of air pollution can irritate the eyes and throat, and those with underlying cardiorespiratory illness, including asthma, chronic obstructive pulmonary disease, or coronary heart failure, may find their condition exacerbated. In addition, exposure to high levels of air pollution significantly increases the risk of respiratory tract infections, including sinusitis, otitis, bronchitis, and pneumonia. Children and the elderly are the most vulnerable. To avoid motor vehicle–related injuries, travelers should fasten seat belts when riding in cars and wear a safety helmet when riding bicycles and motorbikes. Pedestrians may find road conditions in Vietnam to be challenging because of an apparent lack of rules and the large number of vehicles and motorcycles sharing the road. Travelers are advised to walk facing traffic and, when crossing the street, to proceed at a consistent walking pace with no sudden direction changes, such as quickly turning back. Pedestrians will observe that motorbikes and cars will go around them much like a school of fish will part when it encounters an object, and then regroup. Note that motorbikes and sometimes cars will travel on the wrong side of the street (against oncoming traffic) as well as on sidewalks, so travelers should be urged to always look in both directions and be particularly cautious when crossing at corners. Several private medical practices, clinics, and hospitals that serve foreigners are available in Hanoi and Ho Chi Minh City. However, blood transfusion services, inpatient care, and specialty services are generally not of high quality. Thus, travelers should ensure that they have adequate medical evacuation insurance in case they need to be evacuated to Singapore or Bangkok where high-quality specialty services are provided (see Chapter 2, Travel Insurance, Travel Health Insurance, & Medical Evacuation Insurance). To ensure the quality of any needed medications, travelers may want to consider purchasing them through an expatriate or international travel clinic, even if the price is higher. If a traveler is taking prescription medicine, he or she should bring enough medication for the entire trip, in the original bottle, and with the prescription. Carrique-Mas JJ, Bryant JE. A review of foodborne bacterial and parasitic zoonoses in Vietnam. EcoHealth. 2013 Dec;10(4):465–89. Central Intelligence Agency. The World Fact Book: Vietnam. CIA; 2016 [updated 2016 Sep.; cited 2016 Apr. 12]; Available from: https://www.cia.gov/library/publications/resources/the-world-factbook/geos/vm.html. Cuong HQ, Vu NT, Cazelles B, Boni MF, Thai KT, Rabaa MA, et al. Spatiotemporal dynamics of dengue epidemics, southern Vietnam. Emerg Infect Dis. 2013 Jun;19(6):945–53. Hsu A, Emerson J, Levy M, de Sherbinin A, Johnson L, Malik O, et al. The 2014 Environmental Performance Index: country profiles, Viet Nam. New Haven (CT): Yale Center for Environmental Law and Policy; 2014 [cited 2016 Sep. 25]; Available from: http://epi2012.yale.edu/epi/country-profile/viet-nam. Huong VT, Hoa NT, Horby P, Bryant JE, Van Kinh N, Toan TK, et al. Raw pig blood consumption and potential risk for Streptococcus suis infection, Vietnam. Emerg Infect Dis. 2014 Nov;20(11):1895–8. Manabe T, Yamaoka K, Tango T, Binh NG, Co DX, Tuan ND, et al. Chronological, geographical, and seasonal trends of human cases of avian influenza A (H5N1) in Vietnam, 2003–2014: a spatial analysis. BMC Infect Dis 2016 Feb 4;16(64):1391–8. Phung D, Hien TT, Linh HN, Luong LM, Morawska L, Chu C, et al. Air pollution and risk of respiratory and cardiovascular hospitalizations in the most populous city in Vietnam. Sci Total Environ 2016 Jul 1;557-558(2016):322–30. Roberts L. In Vietnam, an anatomy of a measles outbreak. Science. 2015 May 29;348(6238):962. World Health Organization Western Pacific Region [Internet]. WHO representative office in Vietnam. Hanoi: World Health Organization; 2014 [cited 2016 Sep. 25]; Available from: http://www.wpro.who.int/vietnam/en. Yen NT, Duffy MR, Hong NM, Hien NT, Fischer M, Hills SL. Surveillance for Japanese encephalitis in Vietnam, 1998–2007. Am J Trop Med Hyg. 2010 Oct;83(4):816–9.